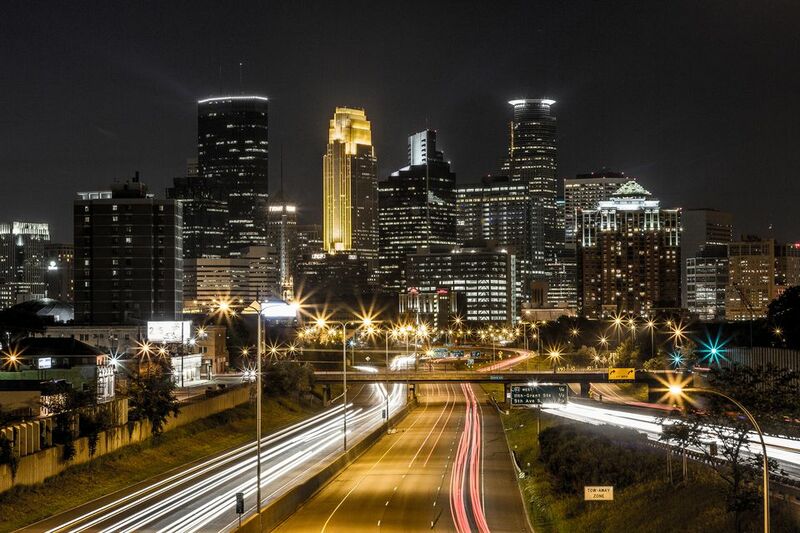 Getting to downtown Minneapolis from Minneapolis-St. Paul (MSP) airport is quick and easy. Minneapolis-St. Paul Airport is only 11 miles from downtown Minneapolis. Metro Transit's Blue Line is the cheapest way and is very convenient. Taxis are plentiful, with fares around $40. Renting a car? Read on for driving directions from MSP to downtown Minneapolis. Metro Transit light rail trains connect Minneapolis-St Paul airport to downtown Minneapolis. This is often the fastest and cheapest way to get from MSP to downtown Minneapolis. Metro Transit's Blue Line light rail trains run directly to downtown Minneapolis. There is a station at both Terminal 1 (Lindbergh) and Terminal 2 (Humphrey), for trains to downtown Minneapolis. Follow the signs at the airport. There are five light rail stops in downtown Minneapolis - U.S. Bank Stadium, Government Plaza, Nicollet Mall, Warehouse District/Hennepin Ave, and Target Field (with two platforms). Your light rail ticket is also valid for use on Metro Transit buses with no extra charge (Your ticket is valid for 2.30 hours). As of January 2018, the one-way fare is $2 during off-peak times and is $2.50 during rush hour times. There are ticket machines which take cash and credit cards at each station. You can also use a mobile app. Trains run approximately every 10 -15 minutes from the early morning until late at night. Trains begin at about 4:20 am, and the last train is around 2:10 a.m. The journey time from Minneapolis-St. Paul airport to downtown Minneapolis is just under 30 minutes. A taxi journey from Minneapolis airport to downtown Minneapolis will cost about $40. At Terminal 1 (Lindbergh), follow signs to the taxi booth, where staff will assist getting passengers to taxis. At Terminal 2 (Humphrey), follow signs to the Ground Transportation Center, for taxi services. At MSP, most car rental companies are located at the airport, with several choices of car rental companies at each terminal. From Terminal 1 (Lindbergh) follow the signs for MN 5, heading east. After 1 mile, take the exit for MN 55/Hiawatha Avenue, heading north, which will take you to downtown Minneapolis. From Terminal 2 (Humphrey), follow the signs for MN 5, heading east. After 2 miles, take the exit for MN 55/Hiawatha Avenue, heading north, which will take you to downtown Minneapolis.